Do You Have Irish Norman Surnames in Your Family Tree? When we hear the word “Norman” in Ireland today, we often think of the “Anglo-Norman” invasion of Ireland in 1170 that we learned about in school. Many of my own friends today have Norman surnames – Roche, Barry, Fitzgerald and so on. We attended the same classes in school, played for the same teams and shared a lot of growing up together. But where did our Norman ancestors come from? To find out, we need to go back to another time andcountry. By 876 AD, the Viking “threat” was well established over much of Europe. Many Vikings were launching raiding parties from their Norwegian home – returning home with the spoils for later trade. Around this time, a man called Harald Finehair was asserting himself as the first true King of Norway. Not all were happy with his approach – including a man called “Hrolfr” (later known as Rollo). Rollo was the leader of a band of Vikings who were together for over 20 years – raiding and extorting tribute on many shores across Britain, Ireland and France. On the 17th of November, 876 – Rollo and his men arrived in the north-west part of France – around the modern city of Rouen. This time they had no home in Norway to which to return. They were looking for a territory in which to settle and use as a base for further raids. They were looking for a new place to call home. Over the next forty years, this band of Vikings carried out raids from this new base – and sent a clear message to the local rulers that they saw this territory as their new home. Charles, King of the Franks, pragmatically decided to formalise this territory as the new homeland of the group and the “Duchy of Normandy was established with Rollo as the first Duke of Normandy. The Norman Way of Life. The land in Normandy was a huge improvement on the old farmlands in Norway. The Norman focus was on the cultivation of grain (unlike the cattle focus in Ireland) – and the rich, heavy soil of Normandy could yield four times more than the stony soil of Norway. Over the next one hundred and fifty years, the Normans settled down with their new neighbours. They strategically intermarried and made alliances – and also copied the French hierarchy headed by a class of nobility. But one aspect of Viking ancestry that the Normans were slow to lose was a restless ambition. A desire to expand beyond their present boundaries and gather more material possessions, land, power and glory. The Normans could back up their individual ambition with the power of feudalism, farming and fighting technology, God on their side – and their use of the castle. Over the course of one hundred and fifty years – from 1047 to 1200 – this Norman ambition and capability triggered one of the most extraordinary expansions of power from such a small area. During that time, Norman Knights had successfully been “invited into” or invaded Britain, Sicily, Ireland and started the first crusades to the near east where they established many more strongholds – all of which were consolidated with the winning and granting of land, building of castles and establishment of a new feudal order in each locality. In 1035, Duke Robert of Normandy was killed on the return from one of these first crusades. And his son, William gradually assumed his power and title. In 1066, the King of England at the time – Edward the Confessor died. William of Normandy had a distant claim to the throne of England and was ready to assert his claim. By September, 1066 – Williams forces were ready to invade England and take what he considered to be his rightful place on the throne of England. His boats, knights, warhorses, archers and soldiers numbered in their thousands. They set sail in October and met the English army at Hastings on the 14th of October, 1066. After a full day of matched and ferocious fighting, William had won the crown of the Kind of England. A hierarchy of just ten thousand Norman knights went on to replace the aristocracy of England – with William, now William the Conquerer, at their head. Five generations later, the descendents and vassals of this aristocracy formed the main part of the invasion of Ireland from Wales in 1170. The Normans would bring their fighting, farming and feudal technology with them – as well as an insatiable ambition – and shape much of what we see around us in the Irish landscape and politics. Even to this day. Irish Norman Surnames of Your Irish Heritage. Norman naming conventions were typically the same as many Irish naming conventions – only derived from French. Of/From – de – e.g. de Bari – which in Ireland became de Barra and eventually Barry. Nickname/Role – le – e.g. le Gros – or the fat one. Another famous Irish role name was FitzWalter which assumed the role (and surname) of Butler in Ireland. QUESTION: DO YOU HAVE A NORMAN SURNAME IN YOUR IRISH FAMILY TREE? You forgot one Norman surname.. my surname Payne came from France and one of our ancestors was a knight Templar Hugh de Payens [ one of the Templars riding the horse on the knights Templar seal ] and was one of the first grand maters Knight Templar . Thanks Tommy for letting us know. Hi Mike, I love reading all the info you put out here. My g-grandparents, Daniel O’Connell and Johanna O’Connell nee:O’Leary were born in Ireland in 1840-41, but none of the information I have (through years of searching) tells me where in Ireland. I have their original marriage certificate showing them married in St. Giles, Middlesex, England in 1867. It also shows their father’s names. I don’t know when they left Ireland to go to England, but they came by boat to Canada, 1870. From their they settled in Missouri. By the way, I believe the Irish of us have an intense loyalty to family. You’re welcome Sue – as you say O’Leary is almost always Cork. O’Connell is very often Kerry. Mike. What does it mean to have royal blood in you? My great, great, great, grandfather change our name from “Klein” to “Cline” I’m curious, any “Klein” or “Cline’s” out there. My dad had his DNA located in Ireland and Scotland. My husband is a Savage. He is related to royalty. I’m not aware of that name in Ireland with the spelling Klein Connie. Mike. I am trying to find them origin of my name rooney in ireland. My mother’s maiden name was Wall – our ancestor, Michael Wall came to the US from Ireland. We were always told that we were related to Vikings and Normans. Dalton here, originally D’Alton. Cardinal John D’Alton was a cousin of my Grandfather. My great grandmother was Mary Dalton (her father was Timothy Dalton) from Athea, County Limerick. Where is the comon name of Costello ? Just saw; that the Prendergasts were listed. They were from County Mayo and Michael Prendergast married Mary McDermott(McDermot) Were both from Mayo? Want to visit their home(which is still there) and the graveyard where they are buried. Many of the “Normans” were actually Flemish hence the large numbers of Flemingtowns or Flemishtowns and the large number of Flemings in Wales and Ireland. In fact, some scholars believe that the majority of the Cambro-Normans were in fact Flemish rather than Norman. Other names like the Baldwins, the De Burghs, Busher, Cullen, Cusack, Fleming, Roche and Sinnott are actually Flemish in origin rather than purely Norman. Towns that are now considered French like Dunkirk, Artois, Calais, Thiepval, Amiens, Arras, Béthune, Saint Omer and Lens were all Flemish cities and it shared a border with Normandy. In fact the battle of Agincourt was fought on what was once Flemish territory and many of the nobles on both sides came from what is now considered Belgium. The French assault at Agincourt was even led by a man who would now be considered Belgian and not French. But…to make a long story short many of the “Norman” knights that invaded and conquered Ireland were in fact Flemish and this is reflected in many of the names and the place names. Not that most of the Flemish ended up in Munster. I’m not sure how that came to be and if it was deliberate. Above needs a correction as follows: My ancestors were Originally called De Burgh and were Normans not Flemish. 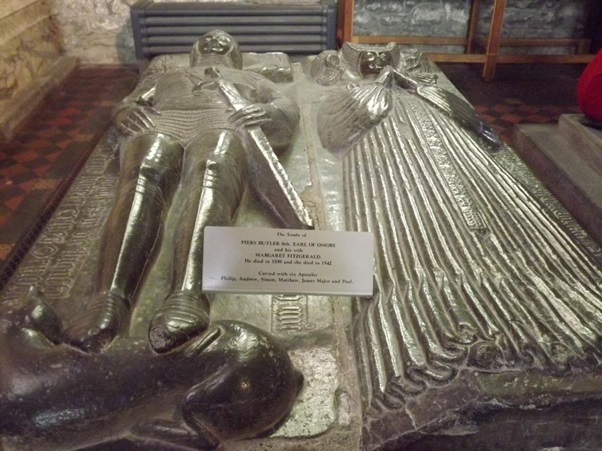 One William De Burgh was with the Cambro Norman invasion of Ireland and Two of the De Burgh’s were half brother’s to William the Conqueror as they had the same Mother but different Father’s, The first Earl of Ulster was a Norman named Hugh De Lacie and The second Earl of Ulster was his Son in Law, Walter De Burgh. ( Latin being the language of the Nobility ) sometimes De Burgh was spelt in Latin as De Burgo and eventually spelt in the Gaelic/ Irish as De Burca and later on became Burke or Bourke or Burk. In Dublin Castle their is an adjoining Church, where there are coats of arms are carved in wood and the De Burgh coat of arms is displayed there too. Also in the Republic of Ireland / Eire there are numerous memorials to the Irish war of Independence and our family name is on them as De Burca and or Burke If you look at the Coats of Arms for the four Provinces of Ireland, you will note that the ancient Coat of Arms for the De Burgh’s is the Ulsters Coat of Arms namely it has a gold background with a red cross, whereas later on a Black Lion was placed in the left hand top corner for the name Burke, hoping this information is of interest ,particularly to members of my Clann De Burgh, De Burca, Burke, Bourke, Burk. I saw that too in my ansestory, anyone else part Ukraine or Russian? I’m half Irish/ skotish. Mike, I’m still looking for Elwood, Sinclair, Shaw and found Kennedy in Tipperary. Robert Elwood, 1751-1818 was born in Armagh, Armagh, Ireland. He died in Ohio, USA,. Any help would be appreciated! Hi Mike! Woot! Found “Powers”! My Dad’s mother’s maiden name! Originally a French name “LePoer”, meaning “the poor one” as they had taken a vow of poverty–this is the most common interpretation. As I learned from your article–originally of Norman descent and originally Vikings! (King Rollo). But Irish all the same (and proud of it!). Butler was my mother’s surname; she was born in Indiana in 1928 and died in 2011. Her father was William Harrison Butler, born in Tennessee in 1890 and died in 1963. His father was George Washington Butler but I have no birth/death/birthplace for him. I had no idea until just recently that we were descended from Norman-Irish nobility. I had always thought that since we were not Catholic – my grandfather was a Presbyterian deacon, though I am Lutheran – we were Ulster-Scots from the North. It certainly makes an interesting ethnic mix with my father’s Swiss-German (originally Mueller) background. Thanks for letting us know Sarah. Family emigrated to Canada from Limerick. Name was De Bhulbh or Woulfe. Want to put the De back in ; why do the Woulfe’s in Ireland not include the De which in the form of the Norman derived name. Chris de Burgh uses the de so why can’t I. My surname is Norman. My dad said it is Irish, but haven’t been able to document it. Can you shed any light on the Norman name becoming a surname? Is Blakeney a norman surname? Glad to see my name(Lucey) on there. Hello, just wondering where in Ireland the Tracey name originates. Am doing genealogy and have not managed to track down where my 3rd great grandfather might have come from in Ireland. the link above will help you there Dorothea. Mike, you omitted the name Fanning, derived from O’Finan with variations being Finan, Fannin, Fanyn, et al. It means “Fair one” and is a patron Gaelic name. We came from Wexford in the 1800’s but prior to that, the name was found in Tipperary and Limerick, where most of the Fannings were mayors and sheriffs in the 1500’s. Cromwell targeted them during his invasion as they were major landowners, including a castle in Fanningstown. Most all their land was confiscated and given to the English with the Irish Fannings being displaced to Kildare. I can trace back on the Cantwell side to the 1700’s but everything before that I haven’t a clue! There are a lot of Cantwell in Kilkenny near Thomastown dunno but they might be distant relatives!! My descendants, Robert & Sarah Moore Coleman sailed from Belfast & arrived in Charleston,S.C. in 1820. what can you tell me about that name? I have a tree under ball/day tree, or Facebook tornadojball to contact me since I miss emails a lot. My grandfather Francis Eugene day came from Ireland. De Burgh is one of our family names and has passed down as a male middle name. The only De Burgh (of Galway)we can trace actually changed his name to Henry John McCook but we have no idea why. It is one of our family mysteries. He married a Lopdell and his daughter married a Scott in Dublin and eventually ended up here in Australia – but the De Burgh name lives on. In reply to Katherine’s comments above re the De Burgh name being in her family. Hi Katherine please refer to my comments above re the De Burgh’s, which was in reply to an article posted above by Seoirse O Duic which hopefully clarifies something for you re the name De Burgh Maybe in the distant past we may be related ????? hi, im sharon could you please tell me what does the name kearney come under be interested to know i believe my family came from waterford? thank you. Check out the above link Sharon. My family name is Loundagin, my ggg grandfather came here from Ireland on 1795 on his uncles ship, there are no records. I can’t find any Loundagins in Ireland. My ancestors came over early and most crossing knowledge is long since lost. One from Ireland was Hodnett from Cork Ireland. They left Ireland around 1680. Another they may have had Norman roots was Bennett. They came over in 1620 from Somerset England. My wife had Orr ancestors that came over later in 1753. Lots of gold and red haired family members. I also come from Payne family and was traced to Norman. Thanks for telling us of The payne surname. I have a tree ball/day. My grandfather was Francis Eugene day and from Ireland. Contact me on Facebook tornadojball or it’s tornado jball. I’ve had multiple strokes. My hair is red in the photo and profile filled with my ink and cats. I grew up with the surname Clarke as did my father and my fathers father ( My grandfather Clarke) I just recently learned that my rightful surname is actually Norman, as my great grandmother birthed a son out of wedlock ( my grandfather Clarke ) apparently awaiting her seaman fiance’ to return to marry her, however he was tragically drowned at sea and their marriage union didn’t happen. As a result my grandfather was raised with my great grandmothers surname Clarke, heanse the loss of the future generations of Norman by my grandfather Clarke. I’ve always thought there were little chance of any Irish in my roots but this revelation opens up a whole lot of possibilities. Delighted to be of help Coreen. I am a Norman too. I’m trying to find out more about my mothers side of the family. Her fathers’ surname was Hannum (Hanham)which from what I can understand came from the Vikings during the Norman Conquest of England. Can anyone tell me more? Thanks for sharing that with us here on The letter from Ireland. Hello from Cincinnati, Ohio. My father’s mother’s maiden name is Jordan. Hi Nicole, Thanks for getting in touch and sharing the surname in your family.